George Graham Reviews "Night Tree"
There have grown to be two schools of Celtic music. There are the strict traditionalists who go exclusively for the authentic sound, and an increasing number of those for whom Celtic music is the starting point for a musically eclectic journey. Eileen Ivers has incorporated blues, Latin American and some South African influence. Shooglenifty mixed Celtic with some hip-hop rhythms and electronics, Maura O’Connell and Tim O’Brien have melded Celtic with bluegrass, the band Notify have brought together jazz-rock fusion electronic and Celtic. Even those champions of traditional Celtic music, the Chieftains, have collaborated with performers well outside the traditional Celtic realm for some interesting blends. Night Tree formed only last year, and came together at the New England Conservatory of Music where they were students, presumably studying different genres. They brought together the odd combination of instruments they were studying, so the band features, two violins, cello, accordion, a saxophone -- usually a baritone sax – and a variety of percussion, running from Celtic to Latin American with the cajon. They say they draw upon Irish, classical, jazz, Swedish folk, klezmer, and Afro-Cuban. They are mainly an instrumental group, and they have already developed a great musical rapport. From the band photos on their website, they look to be barely out of their teens, and include Lily Honigberg on violin, Chris Overholser on violin and viola, Sunniva Brynnel on accordion and lead vocals on the infrequent vocal tracks, Zach Mayer on sax, usually baritone sax, not often heard outside of jazz, McKinley James on cello, and Julian Loida on percussion. Their album was produced by Seamus Eagen, of the popular and also eclectic Celtic band Solas. 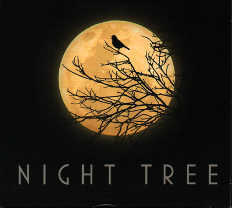 Night Tree, the eponymous debut album by the acoustic sextet of current and former students of the New England Conservatory of Music, is an often fascinating and imaginative recording that mixes influences with abandon, with a kind of Celtic center. Their unconventional instrumentation with three string player, accordion, percussion and baritone sax would seem like the result of an attempt to throw a band together when not enough people showed up for a call for players for an orchestra. But instead they are full of interesting ideas and are great at creating distinctive sonic textures that effectively use what they play. The composing is first-rate, the playing is subtle and the production, by Seamus Eagen, is outstanding. Night Tree’s bio says that the group likes to get together and play in the dark to “allow themselves the opportunity to focus and listen closely to one another.” Whether you listen in the light or dark, Night Tree’s new album is thoroughly enchanting.